Just a quick post for now because I’m really busy this week – I wanted to share one of my new favorite snacking “adaptations” that may or may not be “healthy” but is definitely a better option for those trying to get fit with a sweet tooth. Behold, the Complete Cookie from Lenny & Larry’s. 16 grams of protein, 6 grams of fiber, 100% delicious. 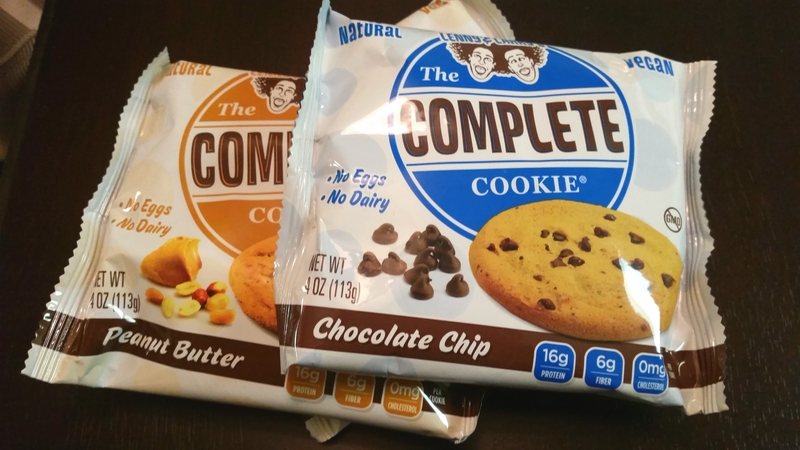 A quirky little company called Lenny & Larry’s had the novel idea to take a delicious cookie and turn it into a protein-packed food bomb. Maybe someday I’ll be able to shake their hands, but for now I’ll just support them by purchasing their awesome products. At 420 calories for the entire cookie, this is a post-workout dessert and still not a substitute for a real meal. The suggested serving size is only half, but if you have a big workout you shouldn’t have to worry about finishing one of these. I made this find at 7 Eleven of all places (not typically a good spot for nutrition) where they were on sale for a dollar (typically around $2). I’ve found them at the grocery store and a few other places since then. Check online to see where you can buy in your area! The company also makes brownies (you can find them on Vitacost – not the cookies though) and all of their products are Kosher, non-GMO and vegetarian/vegan. Other flavors include Double Chocolate, Oatmeal Raisin, and White Chocolate Macadamia Nut. If you’re like me, giving up cookies is almost never an option. Now luckily you can cheat a little and still make your macros for the day. Any recommendations for other “diet” or protein-rich products like this, I’d love to hear them! Oooooo, I will have to try that product! I love quest bars as a high protein snack. My favorites are the cookies and cream and the raspberry cheesecake. I too run a fitness blog. You should check it out. OMG, have you ever seen Quest’s “15 Second Recipe” videos?! They make some insane stuff out of those bars! I really wanna try! Thanks so much for reading I’ll be sure to check your posts out too! I follow quest nutrition of instagram… They just posted a recipe for protein PIZZA! What? YES! I will try to make it soon! Pingback: Good News This Week! | Herbs & Spices. dooo it! snickerdoodle and peanut butter are my faves so far. Pingback: I’m a Lenny & Larry’s Ambassador! | Herbs & Spices.